Happy 4th of July! I hope you have fun things planned for celebrating tomorrow! I will be...not working, at the very least, so that will be a good way to Wednesday! 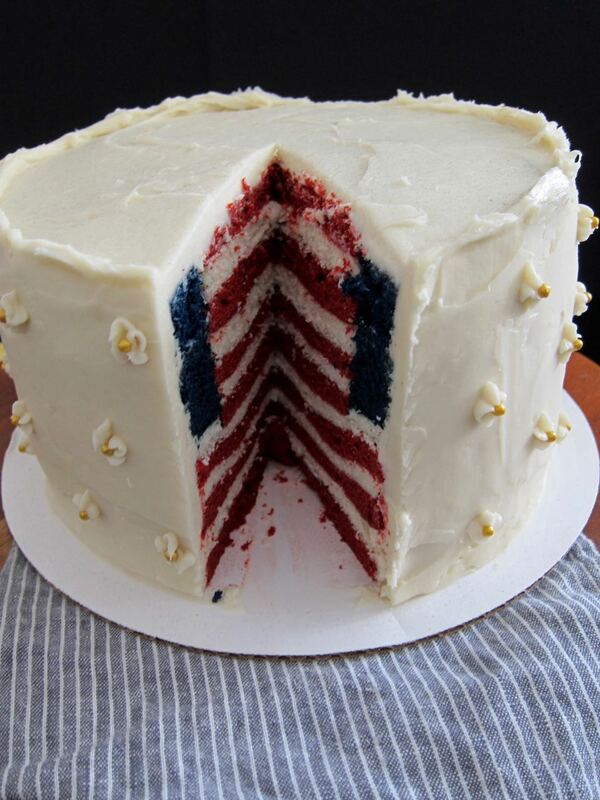 I will also be eating a slice of this cake and some bonus dessert I made with the extras, so even though I'm struggling to feel patriotic these days, my insides will def be red, white, and blue! So, how about this beauty? Can we pause for a sec and just look at this thing? I managed to impress even myself, and as my own biggest critic, that is hard to do. But this cake is an accomplishment, and I'm going to take a beat and recognize that. I took two cake recipes from my favorite cake book, American Cake, and mashed them together to create a tasty, edible flag. The red and blue layers are classic red velvet, dyed with shocking amounts of food dye (so sorry but it's just how you do it) and the white layers are my favorite cake of 2018, champagne (previously here and here). They get stacked with a little peach jam to make it all stick together, and then the whole tower gets wrapped in a cloak of tangy cream cheese frosting. I will pledge allegiance to that! Before you look at this cake and think, "I could never do that, it's too much work," then let me assure you that, yes, yes it is definitely too much work. But you can still do it! I promise, the satisfaction of knowing your cake looks like a real flag with thirteen whole layers of red velvet and white champagne stripes is almost worth it! When you are building a masterpiece, you've gotta spend the time. Now, I say this after the fact, with a hazy recollection of the wee hours of last Friday morning and fresher memories of peoples' compliments. So maybe take everything I'm saying with a grain of salt. I did have my moments of wondering why oh why couldn't Betsy Ross just have stopped with two colors when sewing the flag? TWO WAS FINE! Because by the time I was baking yet a second blue layer the next day and trying to perfectly color match it to the first one, I was ready to call that long-dead lady some not-so-nice names. But again, I was making a masterpiece, and sacrifices will be made, such as sleep and time and adherence to FDA recommended levels of food dye. So I will warn you, the directions below are a tad involved. You can, of course, bake thicker layers and cut them into the thinner layers, but I don't have those torting skills and so I opted for the more time-consuming option of baking my layers individually. But, no matter which method you choose, don't worry too much about perfectly even, stacked layers. This is after all a cake, not a real flag, and you can just tell everyone that your sliced cake is supposed to look like it is waving in the wind o'er all those ramparts. Ta da! Red & Blue Velvet Cake and Champagne Cake layers adapted from Anne Byrn. You will want to make the full recipe for each color, to make sure you have enough batter for all the layers plus any extra for mistakes (trust me). In total, you will need three 8-inch red layers, three 8-inch white layers, four 6-inch red layers, three 6-inch white layers and two 8-inch blue layers, so plan accordingly. Make the red and blue layers, one at a time: place a rack in the center of oven and heat oven to 350 degrees. Butter and flour as many 8-inch and 6-inch cake pans as you have, or use disposable pans. For the red layers you will need three 8-inch pans and four 6-inch pans; for the blue, you will only need two 8-inch pans. Decide which color you are starting with, and make one recipe of the velvet cake: Put the butter and sugar in the bowl of a stand mixer or large mixing bowl, and beat on medium speed until light and fluffy, about 3 minutes. Add the eggs, one at a time, then blend in the vanilla and the food coloring and set aside. In a separate, large bowl, sift together the flour, cocoa and salt. In a measuring cup, stir together the milk, vinegar, and baking soda. Add the dry and wet ingredients to the batter while mixing on low speed, alternating, and beginning and ending with the dry ingredients. Scrape down the bowl as needed. Divide the batter between prepared pans: for the red layers, spread two heaping spoonfuls of batter (see notes) evenly in each 6-inch pan (4 total) and three heaping spoonfuls in each 8-inch pan (3 total). For the blue layers, divide the batter evenly between two prepared 8-inch pans. For red layers, bake the cakes for 6-8 minutes for 6-inch layers and 8-9 minutes for 8-inch layers. For blue layers, bake 22-25 minutes, until a toothpick inserted in the middle comes out clean and the layers are pulling slightly away from the edges of the pans. Let layers cool slightly in pans and then turn out to cool completely on a wire rack. Make the batter again for your second color (red or blue) and repeat. Make the white layers: Again, butter and flour your pans. You will need three each of the 8-inch and 6-inch layers. Sift together cake flour, baking powder, and salt in a medium bowl and set aside. In a separate large bowl, add the egg whites, champagne, vanilla and oil and whisk to combine well. Set aside. In the bowl of a stand mixer, beat sugar and butter for 3-4 minutes on medium speed until light and fluffy. Add the flour mixture and the egg white mixture, alternating, starting and ending with the dry mixture. Scrape down sides of bowl as needed. Divide the batter between pans, spreading 2 heaping spoonfuls of batter in each 6-inch pan and 3 heaping spoonfuls in each 8-inch pan. Bake, 6-8 minutes for 6-inch layers and 8-10 minutes for 8-inch layers, until cakes are just beginning to pull back from the sides of the pans. Cool on a rack for a few minutes, remove from pans and cool completely. When ready to assemble, heat peach jam in a small saucepan over low heat until it thins out a little. Place a red, 8-inch cake layer on a cake board and brush a thin layer of the warm jam over the top using a pastry brush or back of a small spoon. Place a white 8-inch layer on top and brush with jam, then top with a red layer. Repeat until you have three each of the red and white layers. Trim off any rounded tops from your blue cake layers, then, using a 6-inch cake ring or 6-inch diameter bowl to cut a 6-inch circle out of your blue cake layers. Stack the first 8-inch ring on top of your stacked red and white layers, then brush the inside and top of the blue layer with jam. Gently place a red 6-inch layer inside the blue ring, brush with jam, and top with a white 6-inch layer. Brush with jam and top with a red layer, and repeat, until you have 4 red layers and 3 white 6-inch layers. The top layer should be red. Brush the sides of the exposed red and white 6-inch layers and then gently lower the remaining blue 8-inch ring of cake over the top and sides. The top of the blue layer and last red layer should be relatively flush with each other, but it doesn't have to be exact. The difference just shouldn't be so extreme that you can't hide it with frosting. Make the frosting and ice the cake! In the bowl of a stand mixer, beat together butter and cream cheese until smooth and creamy and well-blended. Slowly add in the sifted powdered sugar until fully combined and frosting is stiff but spreadable. Mix in the vanilla and beat for a minute to make sure frosting is as fluffy as can be. Spread a bit of the frosting over the sides and top of the cake to smooth out any crumbs. Chill cake for 20 minutes, then frost with remaining frosting as desired. Slice and serve! I'm sorry to call for 2 kinds of flour, but the champagne cake really gets its amazing texture from using the cake flour, while the red velvet can hold up to using regular AP flour. When I saying "heaping spoonful" for spreading the batters in the pans, I'm talking about regular-sized spoons you'd use for eating, not serving spoons or little teaspoons. You should have enough batter in each pan to fully cover the bottoms but only come up the sides about 1/4 inch, no more than 1/2 inch. I wish I had been more scientific in my measurements but this part was happening around 1 am, so I was not.